Homemade Milk Paint Recipe-Make Milk Paint at Home! Stir in enough skim milk to hydrated lime to make a cream. Add balance of skim milk. Now add sufficient amount of powder pigment to desired color and consistency (Pigment powder must be limeproof). Stir in well for a few minutes before using. For best results continue to stir throughout use. Apply milk paint with a cheap natural bristle brush. Allow project to dry sufficiently before applying next coat. Extra paint may be kept for several days in the refrigerator, until the milk sours. Double or triple the recipe for paint. Allow to dry thoroughly 3-4 hours before use. For extra protection, give paint a coat of oil finish or sealer. Color may change – test in inconspicuous area. Mix hydrated lime with water to make a paste. Add to cottage cheese and stir in well. Leave for few hours – the cheese lump will dissolve completely. Select some powder pigments and add to solution (Pigment powder must be limeproof). Add more water if too thick; powdered skim milk if too thin. Strain if you want a fine paint (old nylon stocking works well). Have a GREAT time painting!!!! 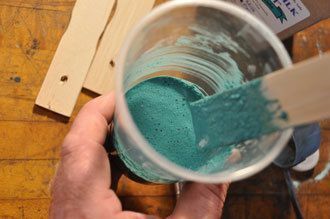 Learn about color mixing techniques or child safe furniture paint.